Hey, y'all! It's Amy here from Step into 2nd Grade. Do you have iPads in your classroom? This post is dedicated to MY favorite iPad apps (as of late). I'm not a technology guru, but I know what keeps my kiddos engaged and strengthens their skills! 1. ChatterPix Kids- I first saw this on Amanda Madden's blog post. We used it to present our penguin research. The kids LOVED it! It's so simple to use, and there are so many options on how to use it. 4. Educreations- this can be used as a interactive whiteboard or for presentations. Some of my students used it to present what they learned about spiders. 6. Math Regrouping- This is one of the only regrouping apps I can find, and I love it! 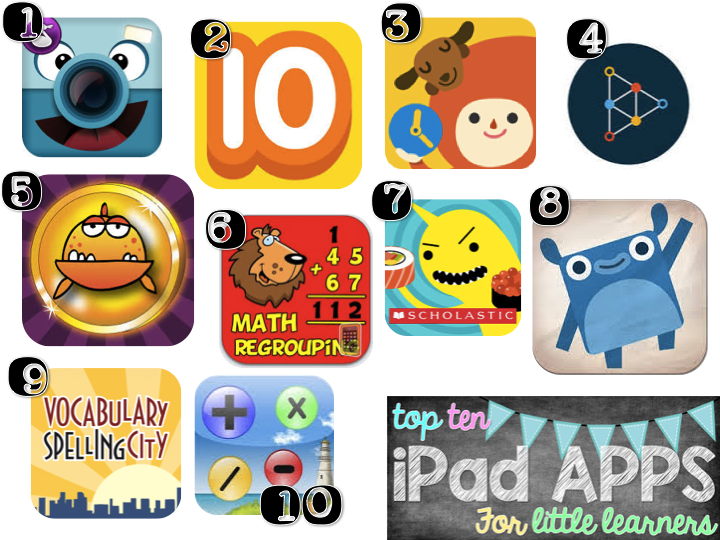 What are your favorite iPad apps?! I'm always looking for new downloads, so leave your recommendations in the comment section below! *We have Nooks, so I may be a little limited. sheppardsoftware.com is my favorite website for math games. Hoodamath is another great one. Kahoot! is amazingly fun for playing quizzes... teacher-directed only. Symbaloo is my favorite app. It's like pinterest for kids. I organize all of my research sites here. I teach K, but my students really like Sight Word Ninja. It might be good for your lower kiddos, and it is free! I like all of the GrasshopperApps (company) I have tried. They are able to be edited to the words/problems/skills you want to work on within the app. They are free or 99 cents each. I know they have a money one, which I don't use in K, but might be good for 2nd. Book Creator is a great one for making books. You can upload them to iBooks, which my students love. Our tech department e-mails us periodically and tells us where around the world readers have downloaded our books. The tech department also publishes our books for us so they are tagged by our district. Great ideas, Amy! I haven't heard of most of these. My class loves Grammar Wonderland. The kids can practice nouns, verbs, adjectives, etc. and its really cute. I recently found Epic! It has free digital books for teachers and it has some great titles too. I haven't tried it out at school yet but I've been trying it out at home. I have AppleTV so I can project the digital books on the Activboard. My kiddos love Geoboard too. So fun for them to play around with making shapes. These are awesome! I hadn't heard of some of these. I am excited to start using them during our rotations. Another app my kids are loving is called Sky Fish. I am fairly certain that it's free, but it works with words and letter sounds. They beg to play it! I love educreations as well! We do so much with that app. Have you tried Buddy Poke? It is a cartoon avatar movie making app. Kids love it and they can be very creative with it.